So, You Think You Want a Bait and Tackle Shop? It makes perfect sense. You love fishing and you like to have lots of fishing stuff around to look at and play with. So why wouldn’t running a bait and tackle shop be the perfect job for an angler? After all, the Bass Pro Shop empire began with a young man who sold bass jigs from cards on his dad’s liquor store checkout counter. So how hard could running a bait and tackle shop be? The one thing that we heard time and again when we started researching this topic of starting a bait and tackle shop is this: If you really like to go fishing, don’t start a bait and tackle shop. You will be working while everyone else is out fishing. You can’t run a successful bait and tackle shop AND be fishing at the same time. That’s the hard part about running a bait and tackle shop. The good part? If things work out, you can make a living selling live bait and gear to anglers, and you can also keep your family busy working in the shop, too. We spoke with some folks who operate a couple of family-owned bait and tackle shops here on the Gulf Coast- one that caters to saltwater anglers, and one that focuses on the freshwater anglers. There are some similarities and some big differences between the two. This points out an extremely important element of all successful bait and tackle shops: Know your customers and know what kind of fishing they are most likely going to be doing. This allows a local shop to focus on selling stuff that will be bought. For instance, the bait shop on the coast near the Gulf will probably not do well selling live crickets. Not many bluegill bream will be found off the beaches in the salt water. Likewise, the shop thirty miles up the road near the Mobile Delta and the freshwater rivers probably will not want to carry a lot of big reef fishing rods and reels and cigar minnows and mullet intended for king mackerel and other big game saltwater fish. Here’s what we found from talking with our helpful friends at Hooked-Up Tackle and Outdoor Addiction- both long-term, successful bait and tackle shops. Hooked-Up Bait tackle carries a wide range of fishing gear and associated merchandise. Photo by Floyd N. Chandler. It should be obvious that where a bait and tackle store is located is crucial to its chances of success. A shop located far from any fishing location is probably not going to survive for long. A bait shop which is difficult to access is probably not going to make it. Both shops we contacted for information are located on busy Highway 59 South in Baldwin County, Alabama. What’s so important about this road? It’s the major road leading to the beaches and the saltwater fishing of Alabama, and the Mobile Delta and its wide range of freshwater fishing options are only ten miles or so from the highway. Thousands of anglers drive this busy road daily, and that puts them in close contact with the bait and tackle shops. The location close to the fishing water is important also because many anglers will be using live bait bought from the shops, and if the live bait must be transported long distances, chances are it won’t be live bait long enough to reach the water. The closer the bait and tackle shop is to the fishing water, the better. Good traffic flow is important for a bait and tackle shop location. The one thing that bait and tackle specialty shops offer their customers that big box stores and other outlets don’t is live bait. Live bait, whether crickets and minnows for freshwater panfish or live shrimp for saltwater game fish, is what bait and tackle shops are all about. And keeping live bait healthy and frisky is crucial for the success of any bait and tackle shop. So, folks who are considering running a bait and tackle shop must be very good at keeping lots of small critters alive- in all conditions. Keeping the shrimp alive can be an interesting day to day operation. Andrew Wright tells us that it’s not an uncommon occurrence to open their shop only to find that the live bait tank hoses have pulled out and the pumps have pumped the water out onto the store floor. Then they must wade through water to get things put back in order. Another problem for bait and tackle shops trying to keep live minnow alive is water temperature. If the water temperature gets too warm- over 75 degrees, the minnows start dying. The one point that all successful bait and tackle shop have in common is that they provide very good customer service. That’s what separates the local bait and tackle shop from big box stores and other kinds of fishing gear outlets. Bait and tackle shop operators must be in the store selling the bait early and late every day and the best and most current local fishing reports are crucial, too. Customers would like to know what’s biting, where it’s biting, and what it’s biting on. And what about the operator of a bait and tackle shop getting to go fishing him or herself? So, if going fishing yourself is most important, perhaps it might be best to let someone else run the bait and tackle shop. But if you love helping other folks have the best experience fishing, perhaps a bait and tackle shop might be in your future. 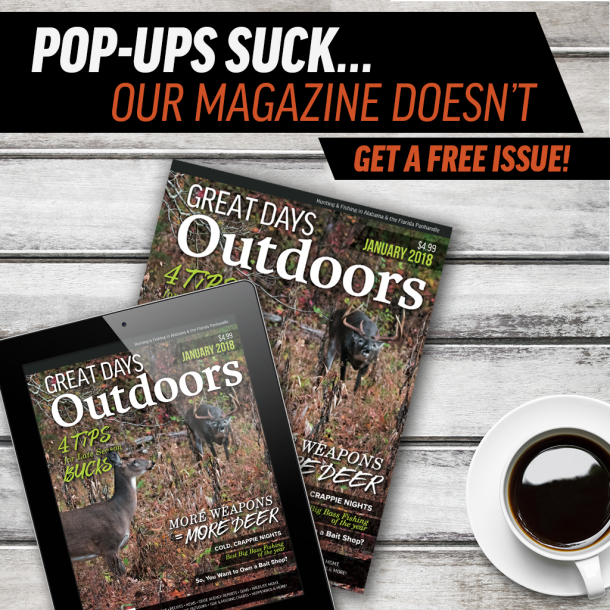 Check your email for your free issue!